Compelling Conversations – Japan- Vietnam: Speaking Exercises for Vietnamese Learners of Englishand Quotations for High-Intermediate Japanese English Language Learners deploys a range of speaking activities, vocabulary expansion lessons, classic quotations, and search-and-share internet activities. The fluency-focused English as a Foreign Language (EFL) conversation textbook includes 12 thematic chapters that explores daily life in Japan and develops English skills. Designed to help Japanese English language learners describe their lives, share their experiences, and develop their critical thinking skills, the innovative conversation book includes activities for asking questions, paraphrasing proverbs, expressing opinions, comparing ideas, summarize articles/videos, discussing Japanese objects, and give reviews. Each chapter concludes with a communicative exercise where students find articles/videos online, summarize the material, and evaluate the information. Chapter sections Sharing Experiences, Vocabulary Expansion, Culture Corner, Ask More Questions, Photographs to Start Conversations, Paraphrasing Proverbs, Pronunciation Practice, The Conversation Continues, Discussing Quotations, Tell Me About Japan … in English, and Search and Share webquests. These speaking activities provide many opportunities for college students and adult professionals to develop, deepen, and practice their speaking skills in English. The Resources and Notes includes reproducible instructor evaluation, peer review, and self-evaluation forms for student presentations; recommended EFL resources; an index of quotations; and an index of proverbs. Written by a team of experienced English teachers, this book expands upon the popular communicative techniques used in prior Compelling Conversations books and focuses on the specific needs of Japanese English language learners. This title is the fourth book in the critically-acclaimed Compelling Conversations series and the third book created for English language learners inside a country (United States, Vietnam). The three authors have taught English to college students and working professionals for a total of over 40 years, including 17 years inside Japan. Buy Compelling Conversations - Japan! 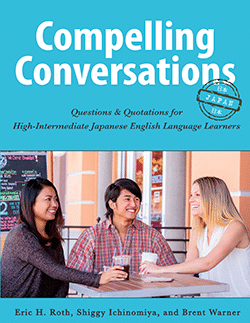 Discounted single copies of Compelling Conversations – Japan- Vietnam: Speaking Exercises for Vietnamese Learners of Englishand Quotations for High-Intermediate Japanese English Language Learners are available directly from Chimayo Press with Paypal. Streamlined for small conversation classes and private tutoring, this essential collection of speaking activities for Japanese learners of English helps students describe their lives, share experiences and develop critical thinking skills in context. Organized within 12 thematic chapters, this abridged text highlights six fundamental classroom exercises per chapter from Chimayo's full-length EFL textbook for Japanese learners to promote authentic conversation. As a result, Japanese ELLs learn to describe their lives, share experiences, and develop critical thinking skills in context.